Wish to know more about the mother toddler program at Cubby Tales? 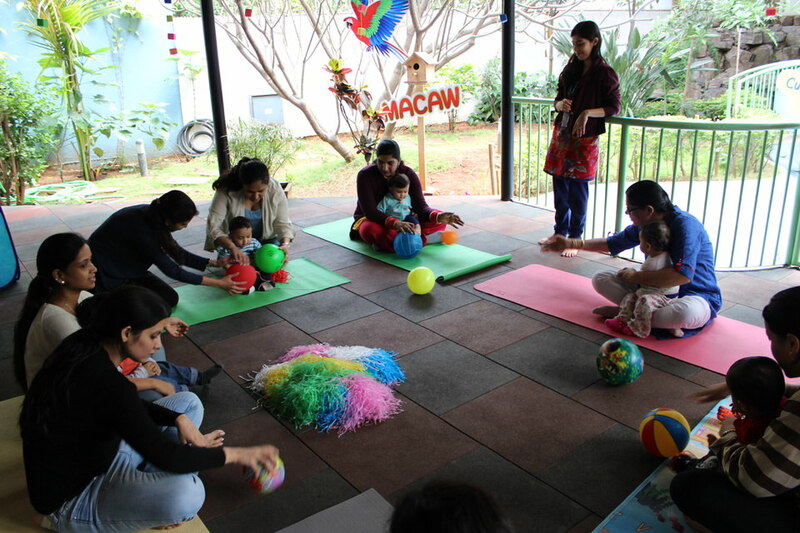 Looking for mother toddler classes in Bangalore? You need to check out Cubby Tales today! From sensorial walks to fun themes, Cubby Tales makes mother toddler classes totally worth your while. Here’s why you should consider them. It was in a mother-toddler program that my 18-month-old daughter first stood up on her own. She was imitating the slightly older toddlers around her and my heart just leaped. When I was a new mom, mother toddler classes saved my sanity. They were havens of quality time away from the constant diapering, cleaning and cooking at home. Being in a nuclear family in a city with no friends, my baby got to interact with other babies and some of the good friends I have till this day are mums who came to that very program, mums who like me had to deal with being new parents and who were trying to make sense of it all. Looking back, I wish that the mother toddler classes of 2011 had brought in so much more to the curriculum and had also focused on language, sensory play and outdoor explorations. When I came across the mother toddler program at Cubby Tales, I fell in love with it. What makes it special? As all the mums whom I spoke to from the program can confirm, the mother toddler classes at Cubby Tales offer a few features that are hard to find in other programs in the city. Tanvi Drolia, founder of Cubby Tales, is so passionate about their mother-toddler program that she facilitates it herself and is very particular about finding the right person to conduct it in the other centres. It is easy to see why. 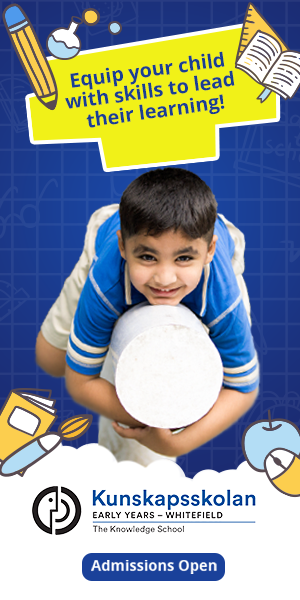 From the program’s ingenious structure to the beautifully crafted activities, it would almost seem like Cubby Tales is making a little bank for the child’s mind, body and soul, which will unlock wonderful rewards when they grow up. The program follows a format that the children love but even this is improvised and constantly updated based on the age and the individual traits of the babies. I realized this when I saw Tanvi engaged in a session of yoga with a group of mothers and their babies. One of the babies was wriggling to get off mommy and Tanvi immediately put him on her lap and continued the class, even showing him the puppet she had used to enact all the moves. He immediately took part with his mum in all other activities. Tanvi makes an effort to understand the babies and to tailor their program to give them the maximum satisfaction. It’s simple – babies are trying to tell us something, they know what they want and are immensely curious little people. The program respects that thoroughly! I was really amazed at how they brought outdoor time into the program. I have not found this in most mother toddler classes. 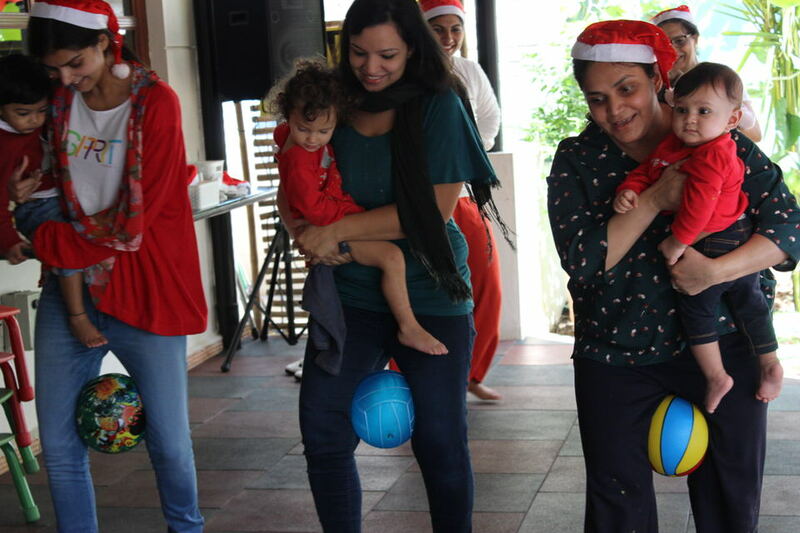 There are activities like basic yoga and Zumba with mums, with the mom-baby duo lying down, making eye contact, enjoying tickle time, and more. 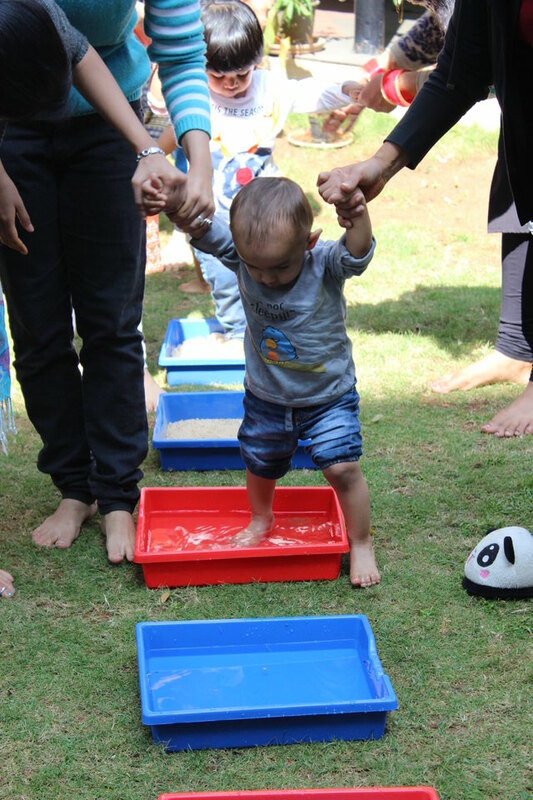 There is also a wonderful experience called the sensory walk, where the little ones walk on pebbles, sand, little tubs of warm or cool water and more. 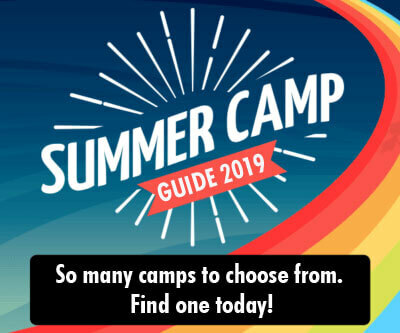 They receive tremendous sensory integration through these tasks, something that children do not find or experience much outside, given how little green space we have in the city or how little time children even spend outdoors. The babies also squish tomatoes, bounce on their mothers’ laps, roll pasta shells in paint and experience lots and lots of touch and texture, which they absolutely love. The day starts with a prayer session, followed by a beautiful roll call system for the babies and the toddlers. Once they come in, each child takes his or her photograph and puts it up on the wall where the session is held, with a little help from mom! Want to develop your baby’s brain to the fullest? Cubby Tales packs in all these gems of activities that will build the brain, so to speak. ‘Mirror time’ has the mums and their children make faces in the mirror and play fun games like identifying their ears, noses, hands and other body parts. The babies also love music, rhyme and song, which the program has in spades! The children are also given activities that improve fine motor skills. This could be something as fun as moving an object from one place to another. One activity involved the children taking a sponge, wetting it and squeezing it into another tub, with a little help from mum, if necessary! 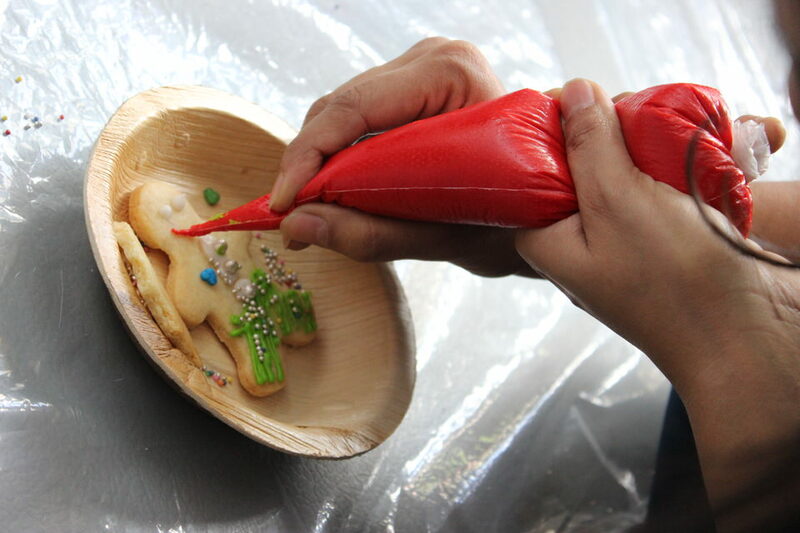 Activities like finger and hand painting or playing with colors – the little ones love them! After every activity, there is a fun ‘clean up’ song that acts as a wonderful cue to get children to put everything back into its rightful place. This is a habit that they carry with them to their homes, with many of them requesting for the ‘clean up’ song when they are putting things back! As a mom, I see children who are brought up with no exposure to nature and the right stimulants. This is precisely what makes the Cubby Tales mother-toddler program so special. It is, I think, one of the most unique and carefully thought out programs for toddlers in Bangalore that I have ever seen.